Jarred Brook, hailing from Queensland has sensationally claimed victories in the Pro 450, MX Open and the Pro 250 classes at the 2017 Australian Senior Track Championship. Hosted by the Tamworth Motorcycle Club, the event was a great success and put on a spectacular show for the local spectators from 8-9 December. 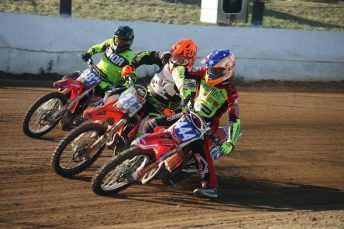 The President of the Tamworth Motorcycle Club, Paul Slade was pleased with the success of the Australian Track Championship; “The event delivered plenty of action and really exciting racing. The track was in really good condition and handled the warm sun well. The standout has to be Jarred Brook – who won the final and Nick Morris won the Pro Open. The crowd was very impressive on Saturday night and riders were very happy with the two-day set up,” Slade finished. World class talent was on display for everyone to see with former champions going up against up and coming new comers. However, it would be Brook to deliver a performance for the ages, taking an impressive haul of medallions for his trophy cabinet. Harry Maxwell was victorious in the Australian Under 19’s class, to edge out Max Whale and Bailey Spencer. It was an impressive debut for Whale in his first senior Track Championship with an extremely close second place in class. In the Senior Dirt Track Sidecar class, duo Darren Fien / Adam Bevan took first place Honours ahead of Greg Parsonage/Steven Smith and Trevo Harvey/ Tim Jones. Victors Fien and Bevan were in top form during the course of the event, taking the wins in every round except round three. For the Australian Pro Open, Queensland hot shot Nick Morris took victory ahead of the in-form rider Brook and the ever impressing Whale. Over in the Australian Pro Women, Briony Hendrickson was the star of the show with a near perfect ride in all races. Hendrickson finished ahead of Amy Wedd and Bree-anna Etheridge. For Speedway Sidecar, Shane Hudson / Cameron Bell won the 1000cc Sidecar final from Darrin Treloar / Jess Headland and Andrew Buchanan/Denny Cox.